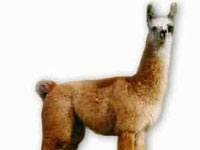 The llama is a South American relative of the camel, though the llama does not have a hump. 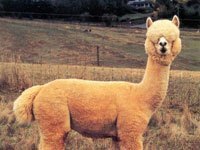 These sturdy creatures are domestic animals used by the peoples of the Andes Mountains. What does a llama look like? 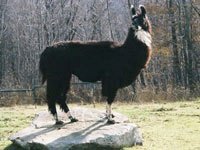 The llama is thought to have originated in North America around 40 million years ago and the llama is believed to have then migrated to South America and Asia around 3 million years ago, before the American and Asian continents finally separated at Alaska. 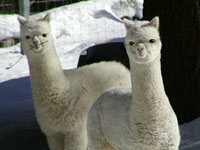 The llama is thought to have become extinct from North America during the ice age. 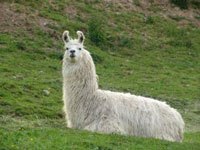 Today the llama is most commonly found in the Andes mountain region of South America where the llama was kept as a pack animal by the ancient Inca people. 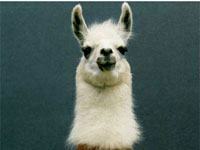 Llamas are used for meat, wool, skin and for transporting heavy loads (a little like donkeys). What does a llama eat? Llamas graze on grass and, like cows, regurgitate their food and chew it as cud. They chomp on such wads for some time before swallowing them for complete digestion. Llamas can survive by eating many different kinds of plants, and they need little water. These attributes make them durable and dependable even in sparse mountainous terrain. What do llamas do when their load is too heavy? Llamas are willing pack animals but only to a point. An overloaded llama will simply refuse to move. These animals often lie down on the ground and they may spit, hiss, or even kick at their owners until their burden is lessened. Download free Llama wallpapers, click on the image to open the large version. Print free Llama coloring pages, click on the image to open the large version.